A compact plantain lily with striking blue-green foliage. The textured leaves are thick and resistant to slugs. It blooms in the summer with stalks of pale lilac flowers. 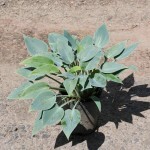 It prefers moist, well drained soil and full to partial shade.